Several days later I found myself, shall we say, fully involved in the making of the fruitcake, with hundreds of pounds of those ingredients strewn out onto our 5’ x 12’ maple workbench. Karl and I poured the white colored and rum fragrant batter onto the top of the fruit and nuts, and then, began to gently turn the pile into a spicy, rich fruitcake mixture, using the full length of our arms. It was tiring. 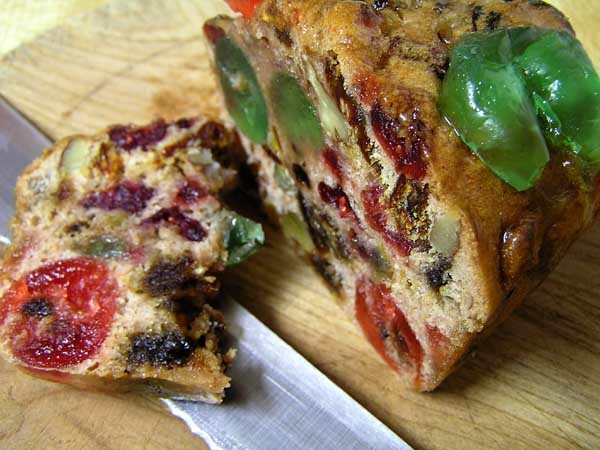 Basically, a good fruitcake contains mostly fruit and nuts, and very little batter. We finished, hosed down, and scaled the finished batter into round pans and full sheets, and baked it at a low temperature all day. When it was almost finished, we pulled the pans from the oven, one at a time, and topped all the cakes with fruit and nuts we had held out as topping, after, of course, soaking it all in rum and flavorings, and finally, brushed on a sweet and shiny apricot glaze over all the cakes. The making of that fruitcake, all those years ago, on that day, when I was still in my 20s, the spectacle of it, hooked me on fruitcake. I decided to like it. 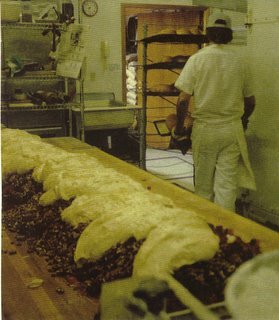 I worked as an apprentice for 3 years, and then opened “Richard’s Bakery” in Tualatin, Oregon. Later, I opened my second bakery, “Favourites Bakery”, in Portland. 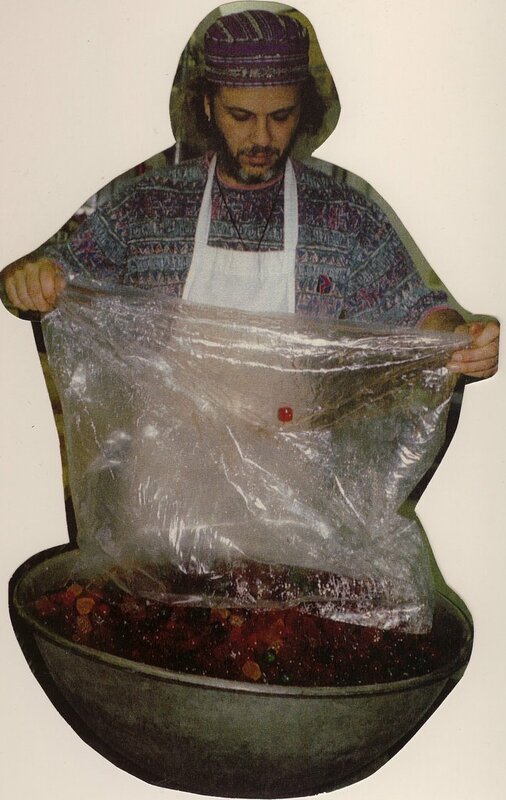 Every year, while I was in business, my staff and I would crank out hundreds of fruitcakes, at Christmas time. Since it was an all day affair, I would try to make it fun, have other foods for the staff, maybe bring in a chef to make u s something, sort of a Special Christmas Party For Baker’s Only. Over the years, “In Defense Of Fruitcake” got around. I had sent a copy to “The Retail Bakers of America”, and through them, others found the article. One year, I think it was 1987, I got several small checks in the mail from newspapers around the country, who had reprinted it. But the coup d’etat was in 1989, when writer Maria La Ganga, of the LA Times, did her research for an article she was doing about fruitcake, and used me, and my tract, as her springboard. The AP came out to my shop and took photos, and on December 13, 1989, the article came out, and was reprinted that year in many papers around the country. In the article, she refers to me as “the father of the fruitcake revolution”. You can imagine what a kick I get out of that. My usual hundreds of pounds of sales went well over a thousand that year. The article is still available to view online at The LA Times archives. I didn’t get on Letterman, which woulda been a riot, me an’ Dave hurlin’ crappy fruitcakes offa the NBC roof, to see what kind of damage we might generate, but I did get phone calls from all over the country, from DJs, whose attitudes ranged from interested and nice to downright stupid. I would take the calls, negotiate my way through their questioning, and dumb jokes, all the while supporting my position on fruitcake. Are you, dear friend, one of the chosen, the enlightenend, the few........who enjoys a good fruitcake, chock full of the freshest pecans and candied cherries and pineapple, bound only by ounces of deliciously spiced and perhaps liquored cake batter? Then bless you! Or are you, poor soul, the one who spouts at the mention of fruitcake, “Makes a damn good doorstop”, or “I hope Aunt Ruth brings her fruitcake this year, ha-ha, we need another football! ?” Then shame on you! In 1975, when I opened my first bakery, at age 27, I will admit that I had my reservations about fruitcake. I was young, inexperienced, and although I’d been exposed to quality fruitcake baking, I had not yet “discovered” fruitcake. 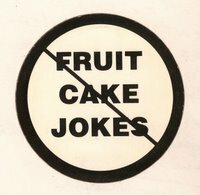 I may have even, at some time in my life, given in to “fruitcake bashing” myself, joining in with the legion of misguided individuals who smear fruitcake, the naive, the palateless. 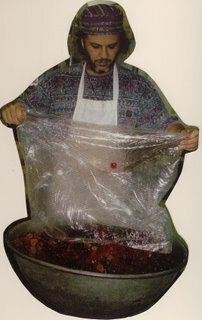 Five minutes ago, here at 3:30 a.m., I turned by hand 100 pounds of beautiful cherries, pineapple, pecans, walnuts and blanched almonds into rum flavor and rum......to soak, and to be used later as the fruitcake topping. The sight of the fruit mixture and the aroma of the flavors are more than heavenly. I know my assistant, Mary, will arrive shortly and exclaim, in a kind of low, sensual tone.....”OHHHHHHHHH,...........Are we making fruitcake today!!!? So what’sa matter? How did fruitcake acquire do many foes? Folks who are assured that most people in the group will agree with them as they wince and moan and gesture their fingers down their throats that fruitcake makes a better paperweight than food.....? Years ago, when Aunt Ruth, and millions of others like her were shopping for their fruitcake ingredients, they found something new on the shelf. Something pretty, something inexpensive..........candied citrus peel!!!! “Wouldn’t that make a fine addition to my fruitcake?”, thought Ruth, “and so inexpensive! !” And so, on that day, millions of pretty, but pretty awful fruitcakes were born. Marvelous little packages, those Currier and Ive embossed canned hostess gifts, masquerading as fruitcake. Those mountains of chain-store gift boxes for the purveyors of the fruitcake myth. The perfectly merchandised two pound cans of batter laced citron, ready to go for $2.99. 1. Try to find an independent baker, whose reputation depends on making “good things to eat”. 2. Be prepared to pay handsomely for a good fuitcake. 4. Serve it ceremoniously, sliced thin, with a good quality coffee or tea. Fruitcake, misunderstood and stripped of it’s former stature by greed and corporate merchandising, needs our help! Enjoy a good fruitcake. Invite some friends! And don’t forget to buy one for Aunt Ruth!